Public affairs experts and advocates attribute several communications factors to the campaign's success and its overwhelming public support. The effort that began with fast-food employees seeking higher, more sustainable wages recently passed a milestone, bringing them that much closer to $15 an hour. In late July, New York Governor Andrew Cuomo’s Wage Board green-lighted a $15 minimum wage for the city by 2018 and statewide by summer 2021. Public affairs experts and advocates attribute several communications factors to the campaign’s success and its overwhelming public support. "The minimum wage has been a poverty-level wage. 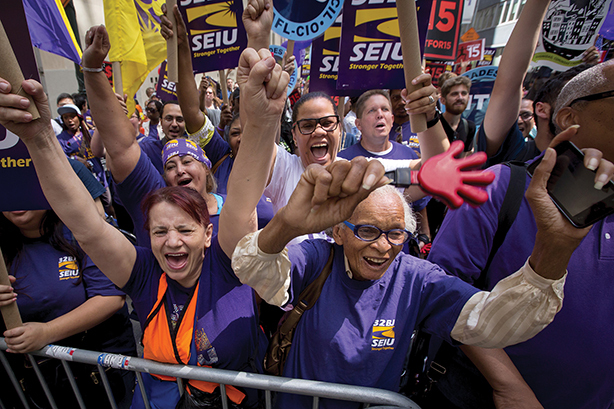 If you ask workers what they want, they want enough pay to be able to live in dignity," says Mike Kink, executive director of the Strong Economy for All Coalition. "That is both the core message of the campaign and the request from workers." The personal stories of fast-food industry workers have made a "consistent, powerful impact," in reflecting "the difference $15 would make in their lives," he adds. Melissa Arnoff, SVP at Levick, says that the lack of "one umbrella organization" for all of the minimum wage-boosting movements may prove to be a hurdle in keeping the message streamlined. On the flipside, individual groups at the local and state level "know decisions get made differently in different places," she explains. While some cities and states, such as Los Angeles County and Seattle, as well as companies including Ben & Jerry’s, have made the jump to raising pay, she notes that "money doesn’t go the same distance everywhere in the country." In August, the Pew Research Center released research that revealed what $15 looks like across the country. For example, the real purchasing power in Beckley, West Virginia, would jump to $19.23 with a $15 minimum wage, while in Honolulu it would only top $12.24. "That fact doesn’t benefit the pro-$15 an hour people, but it can be used by people who don’t want to raise the wage," says Arnoff. Efforts to raise the minimum wage have been surprisingly effective running on a message of fairness, says Harry Holzer, a professor of public policy at Georgetown University. "They’ve painted this as an issue of low-income adults trying to support their families [and that] it is very hard to support a family on $7 or $8 an hour." Opposition messaging paints a different picture, he adds. "A lot of the critics point out the vast majority of people working at minimum wage are not low-income adults trying to support a family," says Arnoff. Rather, they’re young people – college students or recently graduated, second-earners, and low-wage families, where two people are working in a similar position, she adds. "Economists worry that putting the price up of anything means people are going to use less of it," says Holzer. "In labor markets, you force the price of labor to go much higher and employers will use less of it." Still, support has been widespread among the public for an increase. A 2014 survey from Pew showed 73% of respondents supported the federal minimum wage increasing from $7.25 to $10.10. On the other side of the debate, the National Restaurant Association is working to communicate its stance, too. "It’s a diverse industry where there is no barrier to entry," says Katie Niebaum, VP of comms and media relations at the association. "It’s on us to share those stories and make the case when we are being attacked by labor groups targeting the industry." She says the industry’s makeup is a factor. Small businesses comprise 90% and "are independent or franchisee-owned, operating on narrow margins." A minimum wage raise of nearly twice its current rate "would have dramatic implications to our industry and to sectors beyond the restaurant business," she adds. "It would hinder operators’ opportunities to provide those entry-level chances." The increase could also result in "tough choices such as reducing staff levels." The National Restaurant Association is taking its stories to the public as well as policymakers, says Niebaum, to "make sure they understand the implications and what could result from dramatic increases." According to a Pew Research Center study, a blanket minimum wage wouldn’t guarantee pay equality across the country. Maintaining the same "real purchasing power" nationwide "would require hundreds of different minimum wages, scaled to each locality’s cost of living." According to the study, $13.07 in Chicago and $12 in Fresno, California, would be on par with $15 in New York City.